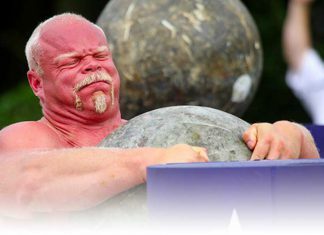 Those new to the sport of strongman may find themselves lost and confused when it comes to training. As we’ve already established, being gym-strong isn’t enough. 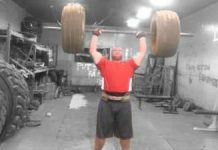 A strongman needs to be a well-rounded athlete with speed, endurance and technique. With that in mind, a bodybuilding or powerlifting routine probably isn’t the best way to develop the skills you need to succeed. 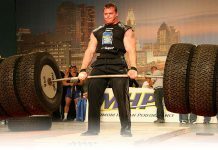 The following routine is designed as a basic guide or template for those new to strongman. You’ll find that as you develop you’ll be able to set your own routine, allowing you to focus on weaknesses and work within your body’s limits. Although complete novices to strength sports are welcome to jump in with this routine, please be aware that it involves relatively complex free-weight exercises and is somewhat reliant on the participant being aware of their base level of strength. If you’re literally brand new to training with weights we recommend you consider laying the foundations first with a routine such as Starting Strength or Strong Lifts. The weekend event work is entirely at your discretion but may well depend on equipment availablity and/or what your training partners are up to. If you don’t yet have access to strongman equipment check out our make-shift strongman kit guide but remember that nothing is a substitute for the real thing! As with most things in life, and especially in strength sports, the “best” training programme is a very subjective thing. The routine above is essentially full-body, three times a week; some may advocate splitting bodyparts as per bodybuilders. That’s fine – we’re sure that’ll work too. 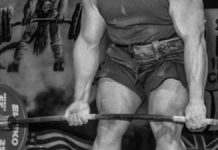 However, we have a sneaking suspicion that many routines will lack the conditioning and event work that should be staple to a fledging strongman’s training. All training regimes require a solid diet. If you’re lacking in protein and lucky enough to be based in the UK, check out our guide on buying high-quality, affordable, protein. We’ll hopefully have an equivilent guide up and running for our friends across the pond and those dotted around the globe. Watch this space. Hi Ryan, we’ve tried not to be too prescriptive, its really up to you to choose exercises that work on any weaknesses or that you simply enjoy doing. Same with the circuit training – as long as it is working on your conditioning its all good! can you make a strongman training routine where there are things like farmers walk, atlas stone, keg toss, yoke and loading race? do yo go straight back to week 1 after 3 or deload? Week 4 deload or back to 1st? What happens with wk 4? Go back to week 1. If you got all your reps last time try a bit of extra weight; if you aren’t getting the reps, stay with the same weight. What is the progression in weight? almost done with the first week, coming from a powerlifting 5×5 10 reps at a time feels heavy even with a lighter weight. Question/ Should you be increasing the weights weekly for the same exercises? I like it, but this really doesen’t say that much… 3 sets of 10, ok, what weight? How much do you increase to the 5×5 and then to 3×3? Should it be 10rm 5rm 3rm? 50%? 60%? 70%? 80%? So.. pretty much the same as thor?